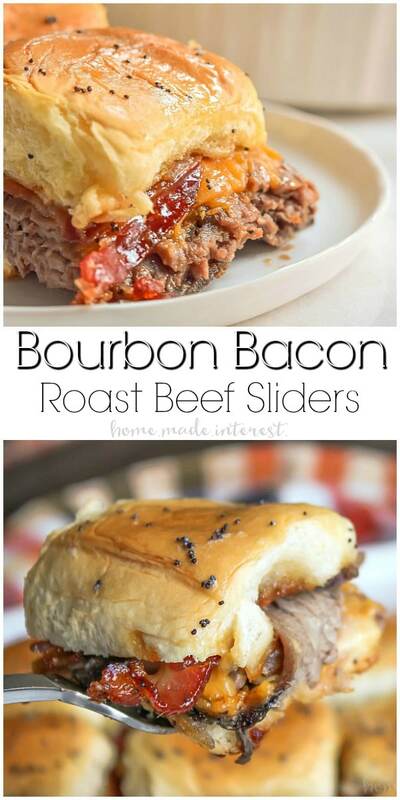 Bourbon Bacon Roast Beef Sliders - Home. Made. Interest. 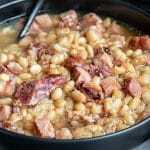 This post first appeared on Bread Booze Bacon where we were guest contributors. 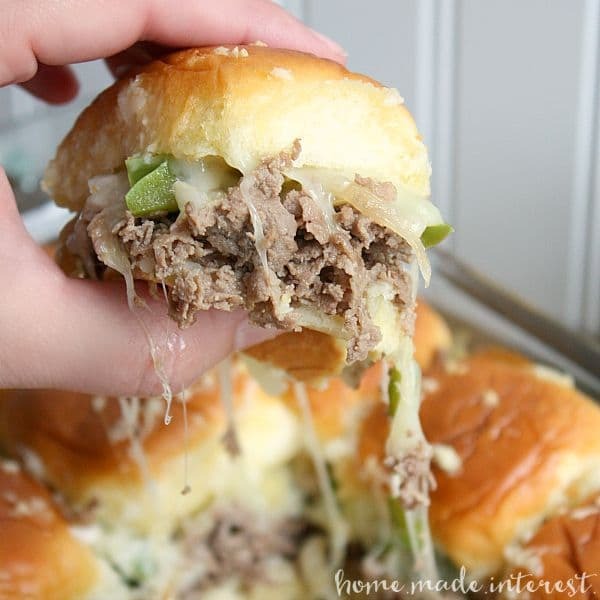 Bourbon Bacon Roast Beef Sliders are an easy slider recipe that make a great game day appetizer! A few months ago we shared this easy slider recipe over at Bread Booze Bacon and it’s so amazing that we thought it was about time we share it with all of you! We’ve been friends with Julie at Bread Booze and Bacon for a few years now and man does that girl know how to have a good time. Between the two of us Melinda and I host a lot of parties and you can bet one of Julie’s unique jello shot recipes is going to make an appearance alongside some of our easy slider recipes at our summer parties this year! Julie’s recipe for Jack Daniels Bacon Mac and Cheese inspired these Bourbon Bacon Roast Beef Sliders. She has this bomb recipe for whiskey candied bacon and we thought it would make the ultimate topping for a roast beef slider. 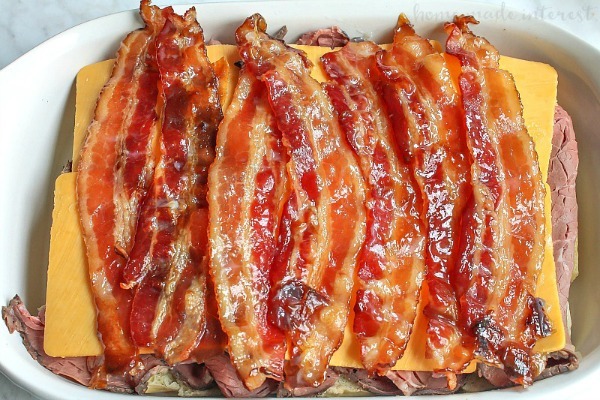 Bacon and roast beef are always a great combination but you coat that bacon in brown sugar and bourbon and you’re talking next level appetizer! We piled roast beef, bourbon candied bacon, and cheddar cheese on soft slider rolls and baked them until the cheese was gooey, and the smell of candied bacon filled the air. Seriously guys, these sliders are so freaking good! The smoky, sweet flavor from the candied bourbon bacon makes these roast beef sliders makes them irresistible. Make them for your summer parties. the candied bacon can be made ahead of time and then it is just a matter of throwing it all together and baking until the cheese is melted. It’s party food at it’s finest! 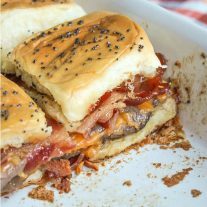 These Bourbon Bacon Roast Beef Sliders are an easy slider recipe that makes a great game day recipe! 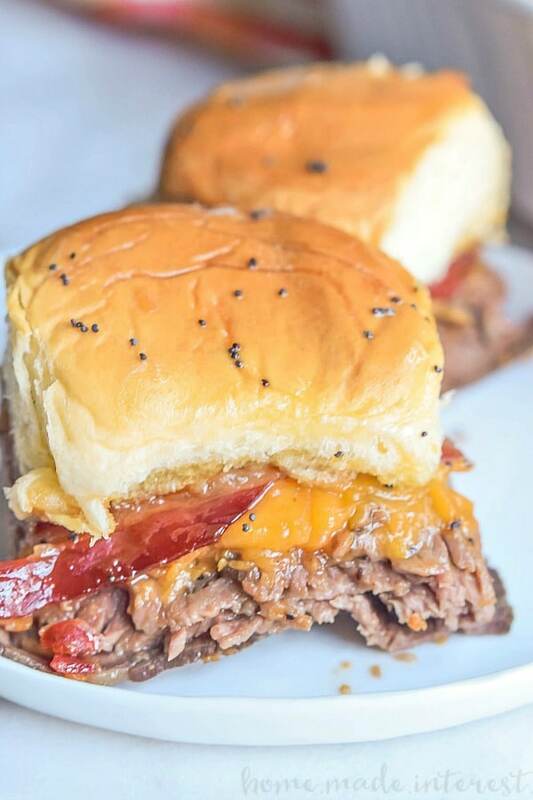 Your friends and family are going to love these Bourbon Bacon Roast Beef Sliders! 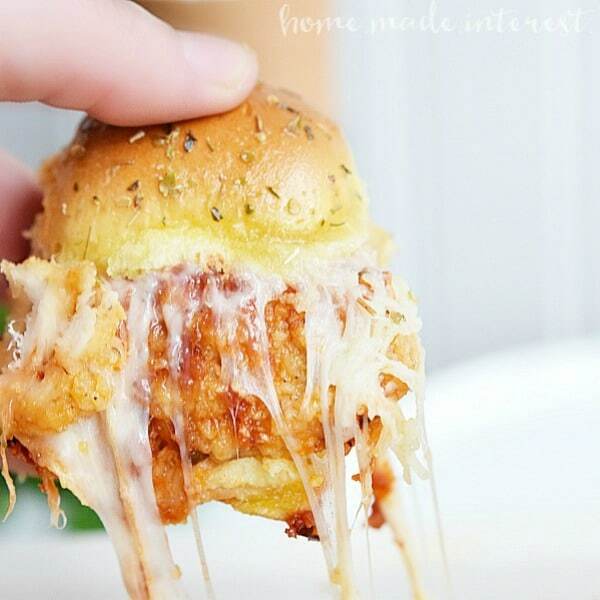 If you’re looking for more easy slider recipes try these!